I am a bestselling author, avid photographer, and enthusiastic world traveler with a weakness for all things beautiful. For years, I have been creating minimalist, Ikebana-inspired flower arrangements for nothing more than personal enjoyment. But now, with the advent of Braiden Blossoms, I finally have a place to showcase my designs. I hope you will enjoy sharing them with me! But there is a bit of a back story. For more than 25 years, I wrote about Pacific Northwest cuisine and wine. I authored seven books, including the Pike Place Market Cookbook (1992 and 2003), the Pike Place Public Market Seafood Cookbook (print editions were published in 1997 and 2005, and the e-edition premiered in 2011), That’s Fresh: Seasonal Recipes for Young Cooks (1995), and Inside the Pike Pike Place Market: Exploring America’s Favorite Farmer’s Market (1999). My seminal work was published by John Wiley & Sons in 2007, Pacific Northwest Wining and Dining: The People, Places, Food, and Drink of Washington, Oregon, Idaho, and British Columbia. For four years I was a contributing writer to The Seattle Times Pacific Northwest magazine, penning Taste columns on such wide-ranging topics as savory desserts, Caesar salads, oak wine barrels, and hard cider. 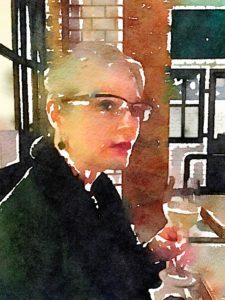 I served as food editor of Seattle Homes & Lifestyles magazine and was a columnist for Wine Press Northwest and CityFood magazine (based in Vancouver, British Columbia). Early in my career, I contributed a bimonthly article to NW Palate magazine. I also founded, photographed, and blogged on the Northwest Wining and Dining website. Although I no longer post there, the site still features a wealth of creative seafood and produce recipes, cooking tips, and archived blog posts. If you enjoying cooking and eating, please check it out! I also founded and edited the Five More Minutes With website, which features inspirational-tribute stories of dearly departed family members, friends, and companion animals, along with Inspiring Moment photos. After retiring from food and wine writing and blogging at the end of 2014, I focused on a fictionalized memoir of my father’s final years. But after struggling through countless rewrites, I realized that nonfiction was my true calling and passion. Braiden Blossoms is my most recent reinvention. My latest “brai(de)nstorm” highlights photos of my floral arrangements (many of the flowers purchased at my beloved Pike Place Market), world travels; and whatever other subjects capture my fancy, such as the Winter Garden. I figure that if I find something that is important, moving, enticing, or even funny enough to spark my interest, maybe it will capture your interest as well.